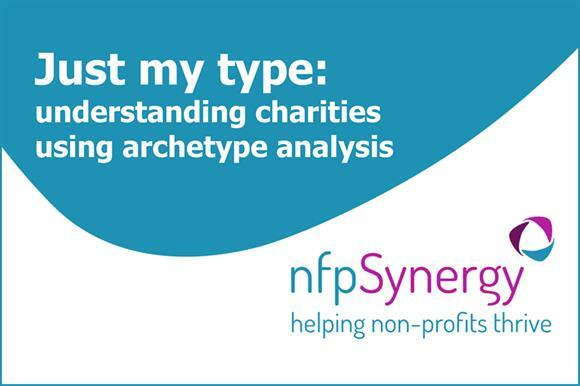 The research consultancy nfpSynergy has set out a new way of categorising charities to help organisations and donors make more valid comparisons. The consultancy carried out the exercise because it felt the sheer diversity of the charity sector made it difficult to benchmark measurements such as fundraising/cost ratios. NfpSynergy analysed the latest accounts of 2,061 charities in England and Wales with annual incomes of more than £5m and identified six types of charity based on their main types of income and expenditure. The report, Just My Type – An Archetype Analysis of Charity Finances, published today, identifies the following categories: contractors/service providers (such as Mencap and Leonard Cheshire Disability); linked Trusts (such as the British Museum and the British Gas Energy Trust); traders (such as the British Heart Foundation and Age UK); investment trusts (such as the Joseph Rowntree Foundation and the Tudor Trust); fundraisers (such as Battersea Dogs & Cats Home and the Great Ormond Street Hospital Children’s Charity); and legacy fundraisers (such as Donkey Sanctuary and Cats Protection). Joe Saxton, co-founder of nfpSynergy, said charities were so diverse that using average figures to compare performance was like comparing apples, oranges and bananas. He said it made more sense to think about six sectors that shared a legal form, rather than one sector. "For some time it’s been clear that the sector is not homogeneous," said Saxton. "It’s made up of a number of different types of charities that make their living by securing their income and spending it in different ways. "Our analysis demonstrates just how different these charities are, both financially and in terms of staff numbers, highest salary and percentages of charitable income and expenditure." Saxton said he was most struck by the sheer volume of contractors and service providers, as well as the vast number of linked trusts, which formed the second-largest category. He said board members could use the data to assess how charities were performing against similar organisations rather than a more crude sector average. The research, known as "archetype average", picked the most distinctive cases in a dataset. Charities that derived income from a range of sources were categorised according to the dominant source. For example, the report says that the Stroke Association is 39 per cent fundraiser, 28 per cent contractor and 24 per cent legacy fundraiser. It was therefore classified as a "fundraiser".